Short-eared Owl (Asio flammeus). Taken at East Hendred Down, Oxon, on February 27th 2019. Taken at East Hendred Down, Oxon, on February 27th 2019. The Short-eared Owl has long, narrow, pointed wings. Its head is comparatively small and rounded. Its plumage is pale yellow-brown and buff-white, and is heavily streaked. It has short ear tufts, which are rarely seen. It is local in northern Britain, and sporadic in the south. It is widespread in Europe. It breeds in heathland, in scrub among meadows, and on bogs. 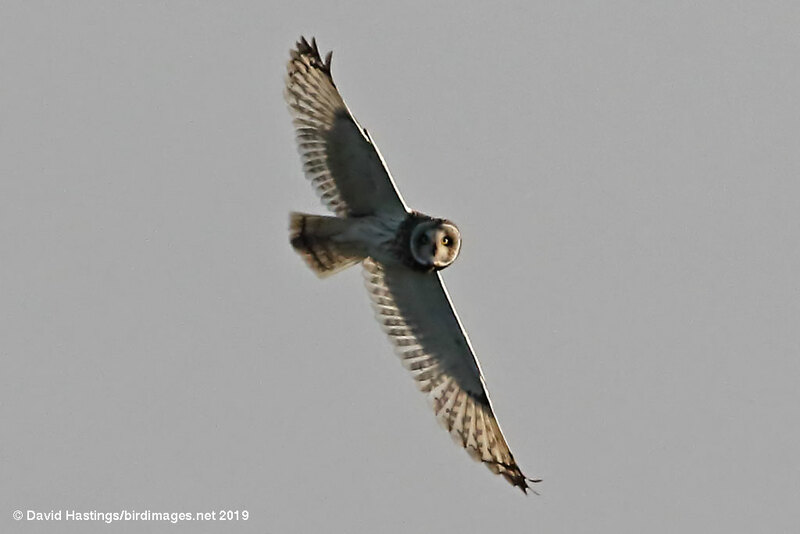 The Short-eared Owl is partly diurnal, often flying in full daylight in the boreal summer. It has Amber status on the UK list. Between 620 and 2180 pairs breed here.